The Gather Picking Panel allows you to pick any value, such as an anisotropic parameter. Here, you can define your input volumes and assign each one a discrete value. 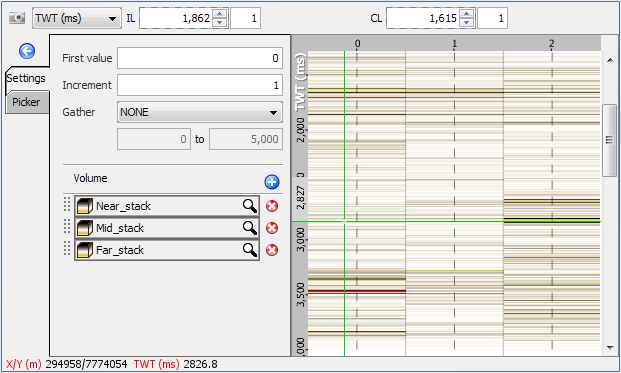 At each location, the picker will show you the displays from each of those volumes, and you can pick which one you like best at a given time/depth. Using the picks generated in this panel, the Picked Function Model will then convert them into a single 3D volume with the picked values smoothly interpolated (see Picked Function Model). From the View menu in the Control Panel, select Gather Picking Panel. In the Settings tab of the panel, click the Add icon at Volume to select your input volumes. If you wish to use gather volumes, select the type (i.e. offset, velocity) and define the extents of the gather to display in the panel at Gather. At First value, type a discrete value to assign to your first volume, and the Increment at which the values will be assigned to subsequent volumes. You can change the order of the volumes by clicking to the left of the volume and dragging it up or down. In the Picker tab, click on the Add icon to create a new picked function or load an existing picked function (.dugpf file). To create a new picked function, first type a name for it and click OK.
Click on the pencil icon to enable picking. Click anywhere on the volume to pick. Right-click on a picked point to delete a pick. When you have finished picking, click the pencil icon again or press Escape to disable picking (see Hotkeys). Press the Up/Down arrow keys to move to the next inline or Left/Right to move to the next crossline based on the increment in the navigation bar. Alternatively, change the IL and CL directly from the navigation bar. Note: Pick at a variety of locations, choosing the one that looks best at each time/depth. To change the display of the picked function, click on the colourbar to change its colour or adjust the line thickness at Line. Select the Show on Map check box to display your picks in Map View. When you have finished picking, create a Picked Function Model process to create a model from the picks (see Picked Function Model). 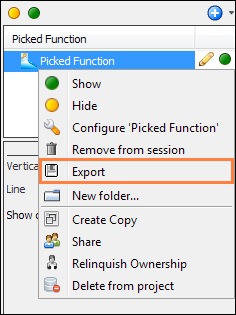 In the Picker tab, right click on the picked function and select Export. Type a name for the file and browse to the desired directory. Click Save to export the picked function in .dugpf format.